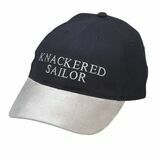 For the fair-weather boating man, there is a crisp white cotton cap with shiny peak, yellow braiding, embroidered badge and gold-coloured anchor. 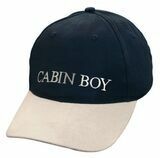 The cap is made of strong, 100 % cotton twill material with a sweat-resistant hem and reinforcing sewn around the inside. The size-adjusting strap has metal buckle and metal sleeve for tucking away the end neatly. 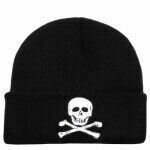 Stylish knitted hat- Skull & Crossbones is made of akryl. One size fits all. 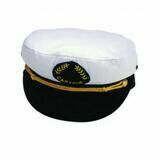 Stylish knitted Captain hat is made of akryl. One size fits all. 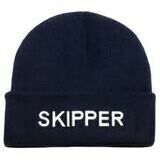 Stylish knitted Skipper hat is made of akryl. One size fits all. 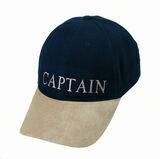 Stylish knitted Crew hat is made of akryl. One size fits all. 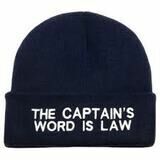 KNITTED BEANIE HAT- "THE CAPTAIN WORD IS LAW"
Stylish knitted hat "The Captain Word Is Law" is made of akryl. One size fits all. 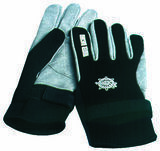 Designed for dinghy racers of all levels, these gloves provide you with the grip and comfort you need when on the water, in tough conditions for long period. Neoprene wrist for comfort. Printed Amara on fingers and palm for grip and long life. Knuckle panel for protection and durability. 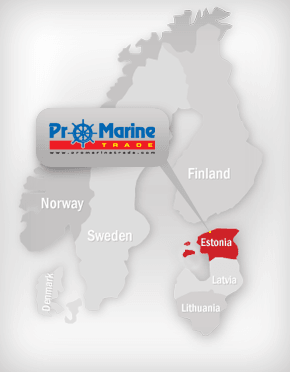 Osculati sailing gloves made of elastic Neoprene 3 mm fabric and Amara synthetic leather seawater resistant with elastic fabric and wrist Velcro adjustment, reinforced palm. 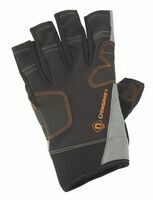 Also for winter use.